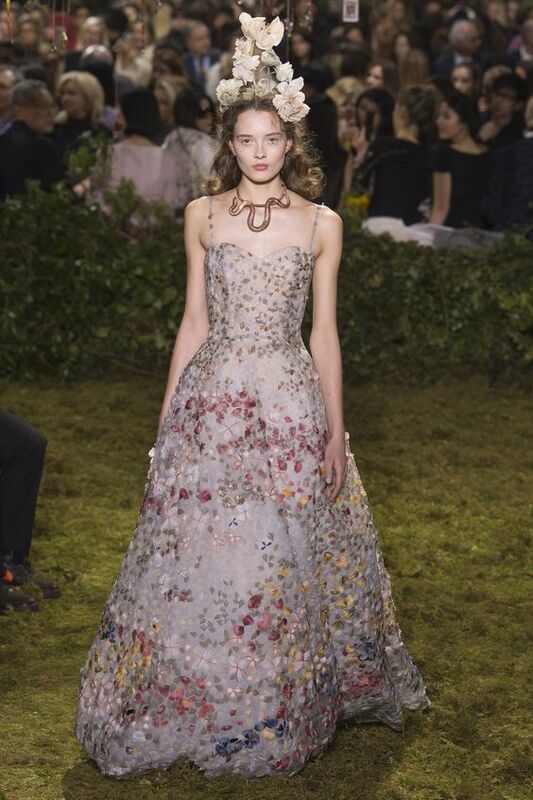 Oh, how I have missed the romance of Dior Haute Couture. 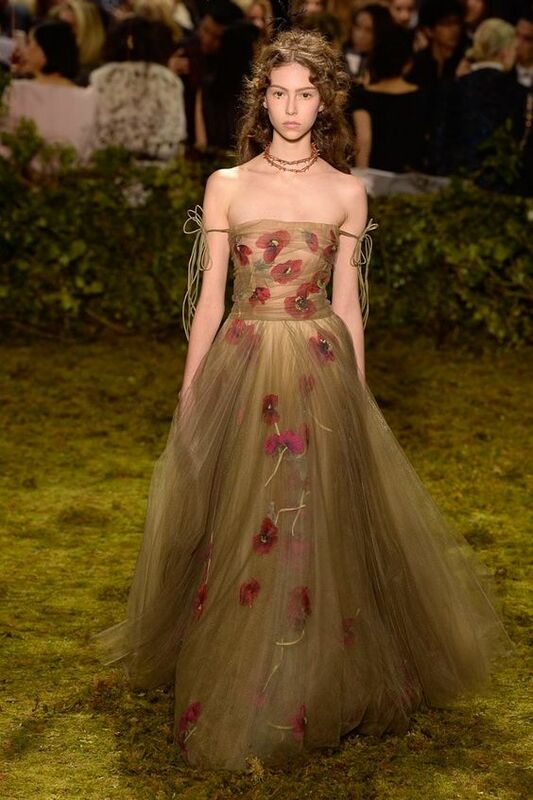 I was not sure what to expect from Maria Grazia Chiuri, but I was certainly ready to see Raf Simons move on from Dior Haute Couture. And I can't say I was all that excited after her first ready to wear collection. Then again, mass produced fashion is not all that exciting to me these days . . . 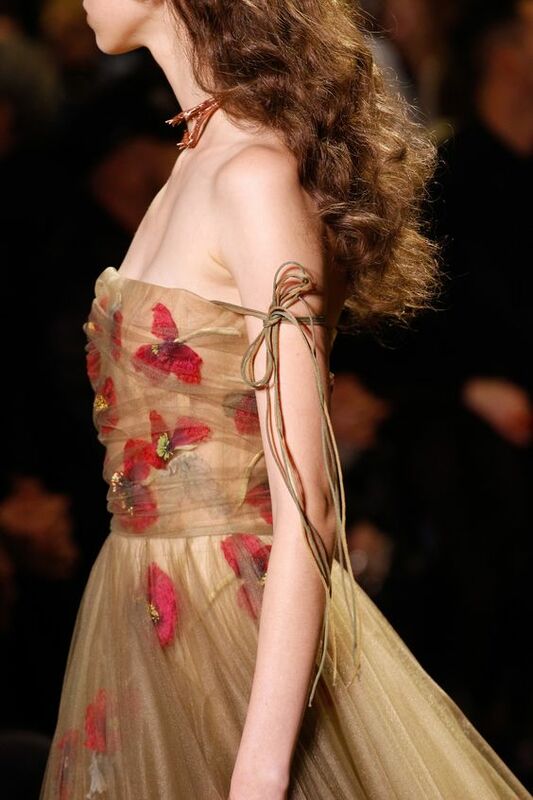 But I am thrilled to see such whimsical and truly lovely pieces on the runway, albeit a non-traditional one. I wonder how many attendees went home with bits of moss in their shoes? Although I may have to wait until the stormy weather moves on, it is definitely time to pull out all of the fabric flowers I used to wear in my hair ten years ago. Many of these pieces conjures images of Pre-Raphaelite ingenues which reminds me of late 1990s romanticism. I definitely would have wanted my prom dress to look just like one of these gowns, and my hair to be a mass of curls topped with a bouquet of silk flowers! 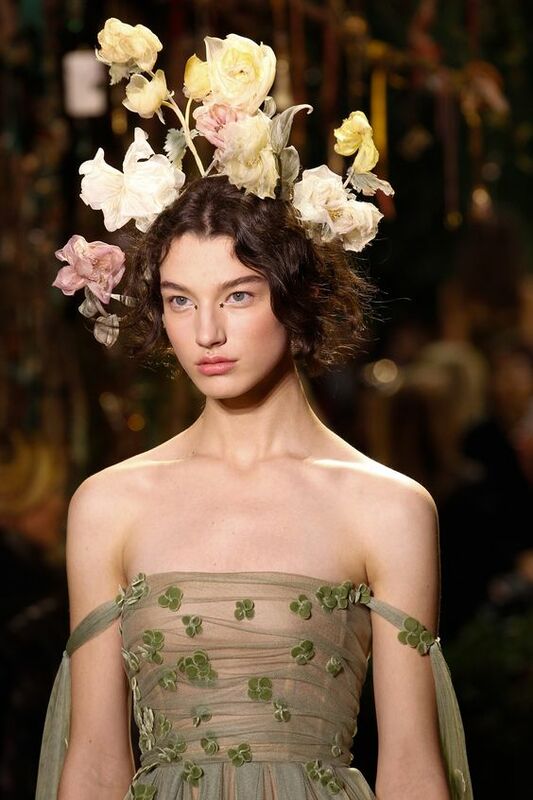 There is definitely a flavor of Grazia Chiuri's past work for Valentino, and I am looking forward to seeing where she will take Mr. Dior's house of flowers in the future. And for those who prefer a bit more structure in their wardrobe, there are certainly some fabulous options (which probably requires that you have an extra $20,000 to spend on a new jacket - but for those of us with a sewing machine, where there is a will, there is a way). I now have an urge to make a hooded garment in velvet. Yep, the 90s are definitely back . . .
And then there are the perfectly tailored pieces giving new life to the iconic Bar Suit. Personally, I am not sure how the original could ever be improved upon, but I do like to see what each new designer does with the idea. A tea length version over a sheer skirt is pretty fabulous. 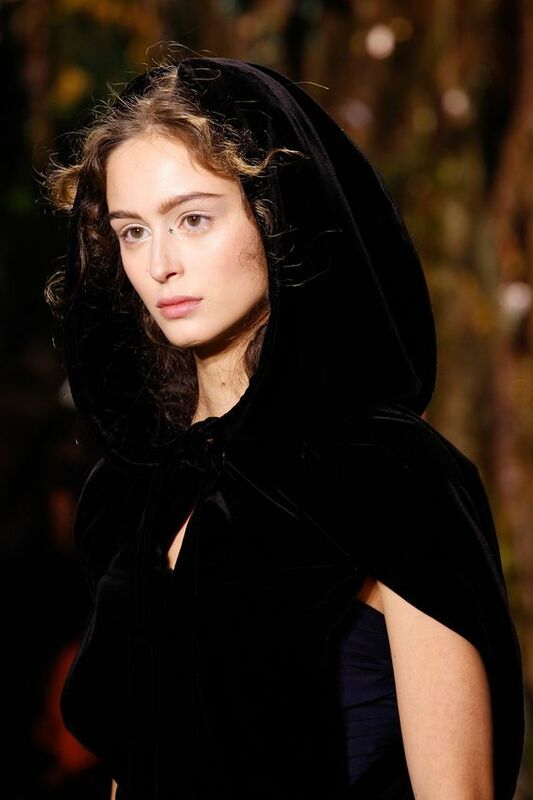 If this first collection is anything to go by, I am so very pleased with Dior's new artistic director. Mr. Galliano is still very much missed, but I am completely enchanted with this collection, and I can’t wait to see what comes next! On another note, this gown needs to get in my closet immediately - and I will be needing a moss covered woodland forest to frolic about in! So, are ya gonna do a prom dress post (yours, other's, and guidance for those in the market)? Now, about those Dior's...how about a velvet bar suit, in a moss green (though I think bottle green or a medium deep emerald would elevate your allure, mystique, and style-disruptor quotient). There is a great deal of corsetry in these designs, and that has been one of your hallmark feature of your show-stoppers and jaw-droppers. As a begrudging loyalist to your blog, your interior construction efforts are as striking as any outer garment you model. I vote for a deep "V" actual corset under a velvet bar suit (padded hips again, please), with a razor thin plunging jacket (standing collar). If anyone can create such a stylish scandal while exuding decorum, it is, and has been, you. Suit up, Laura Mae, and take only the prisoners of interest. I went deeeeep into moss green fabrics this winter and forgot why until now. I have to admit, I like the moss carpet idea the best. The decoration is the most interesting part of these dresses. Great poppies. I can see you in the first photo, as well as one of the Bar suits. It would be interesting to see you in all black...the focus would be on the design lines (and your excellence at construction - both interior and exterior) rather than color. Having said that...I have always admired your sense of color and what fits your coloration. Black would be an interesting departure IMHO.